Utah's state entry was a cozy club house of modern style of architecture erected by the Utah Commission near the state buildings entrance. It was erected from designs of Director-General Whitaker, and was a replica of a residence of the state of Utah. Mrs. Inez Thomas was appointed hostess of the building. The two-story structure was 50 by 50 feet and cost 6,000 dollars. Inside, the Utah building included a reception area, with four side rooms. The second story housed five rooms. Over 300 different photographic and works of art pertaining to the state were hung throughout the building. Each room's carpet was a different color. Visitors were given a small burlap souvenir of salt from the Great Salt Lake. On October 10 (Utah Day), 250 Tabernacle singers performed for guests. At the Mines and Metallurgy Palace, Utah had an impressive display of gold, including a machine built of burnished steel, copper and silver 14 by 30 feet, and entirely covered with a glass case. Iron and iron-based products were shown in another and the state proudly showcased precious stones, including topaz, garnet, ruby and opal. gold medals, as well as several minor awards. 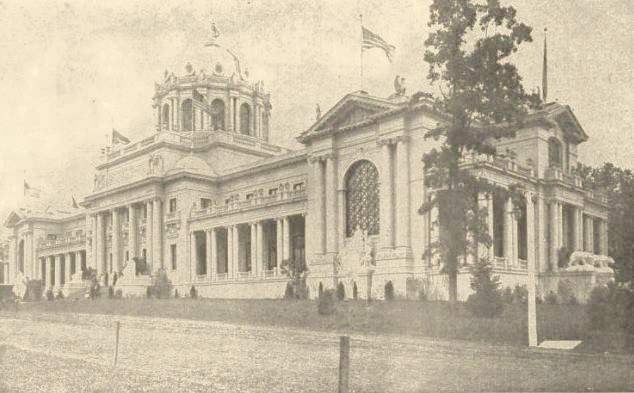 The Utah building is one of the few Fair buildings still standing today. After the Fair, it was moved to a residence south of Forest Park. Utah display in Palace of Agriculture. Almost half the display was made up of a diarama of a Utah Valley.